It seems no matter where I run to or where I run from, I can't get away from my life's only predicament. That which I conceptualize intellectually, I fail to manifest realistically. It is an endless cycle. Over and over and over again. I've thought it, said it, written it, and yet I go back around again. 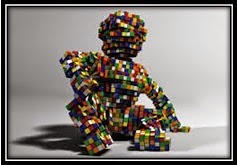 It is my life's Rubik's cube and while my vision is blinded to various colours on the cube, I don't believe that not solving it is an answer or an option. Some days I take off my glasses, blurry-eyed to every colour, and I throw the cube into the deepest and darkest hole that I can find. But I still don't forget it. Eventually, I put on my glasses again and glance at it from afar. My heart wants to reach for it, yet my hands don't. I then recall the words "love thyself" as that may be the only obstacle keeping me from it. Nonetheless, I turn away making the first of many bad choices. But the heart remembers. It always remembers. I extend my hand to touch the cube from afar, but I am much too afraid to attempt to work at it. What is there to fear? But the mind still remembers. It always remembers. I hold the cube in my hand, secretly thrilled at this mini step while simultaneously grieving the predictable expectation of no progress. I release it. And I cry because my heart and mind know better. I will be judged by what they know is truth while I busy myself with my self-imposed recklessness and heedlessness. اللهم اغفر لي وجميع المسلمين آمين.